The Maincor Heat Pump pack is for use when water blending controls are not required. 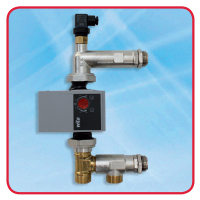 The unit is pre-assembled and is designed to be fitted on to either side of the manifold. A high limit shut off is included and pre-set to 60oC.